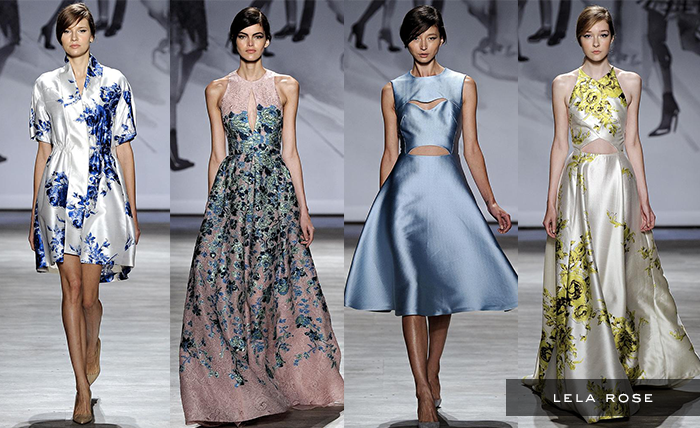 Lela Rose is always a favorite runway show of mine – her spring/summer ’15 collection is what dreams are made of! Her signature hyper-feminine, flattering silhouettes were accented with sweet and sensible cutouts, bold florals and a few other powerful prints (hello, giant polka dots!). Shop her current fall collection here. This was my first time being invited to Nanette Lepore‘s show, so I was very excited for a new experience. Her collection is filled with vacation-ready pieces like flowy dresses and printed pants, pops of sunny yellow and the most mod sandals – ideal for a trip to South Beach! Shop Nanette’s fall collection here. 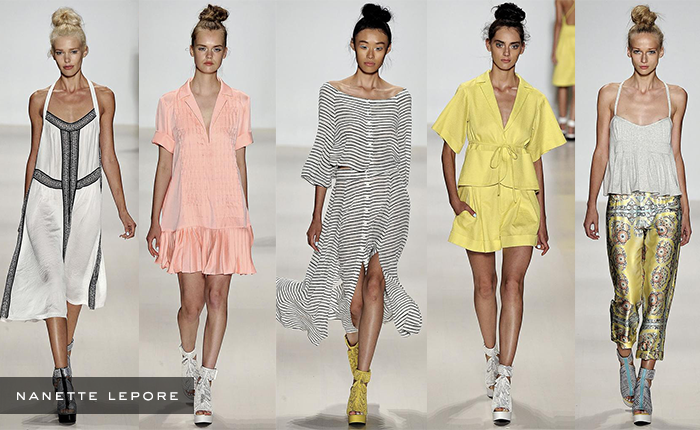 Misha Nonoo was certainly the most entertaining of all the runway shows that I attended at fashion week. 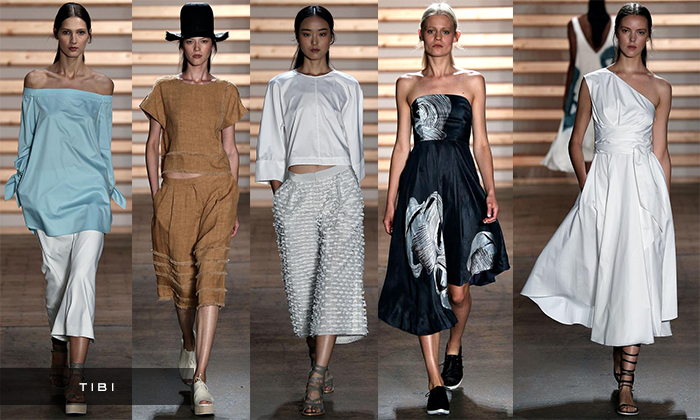 Not only were the pieces elegant with dramatic draping, summer-ready short sets and the prettiest prints (inspired by Brooklyn-based artist Dustin Yellin), she actually sent Yellin down the runway in one of the pieces he inspired – carrying an iced Starbucks coffee, no less. I love how she shared her show with him – artists inspiring artists! A couple of his pieces were even featured outside the venue. Check out her current collection available here. 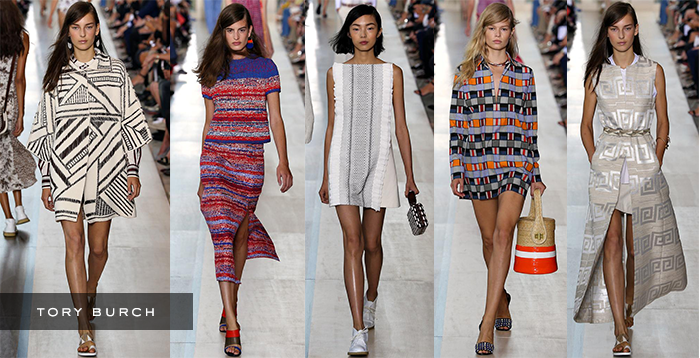 Another old (but always fresh) favorite of mine during fashion week is Tory Burch. Her silhouettes are always wearable, cool and fabulously fun! From the oversized earrings to fringe-adorned hems, it’s all in the details. My favorite look was the graphic-print blouse + 3/4 sleeve coat combo you see on the far left – it makes a statement while still being effortless and chic. Tory Burch’s fall collection is also not to be missed – shop it here! Another new show I added to my books this season was that of Ohne Titel (a big thanks to my gal Sonia from RMO-Wetherly for hooking me up!). 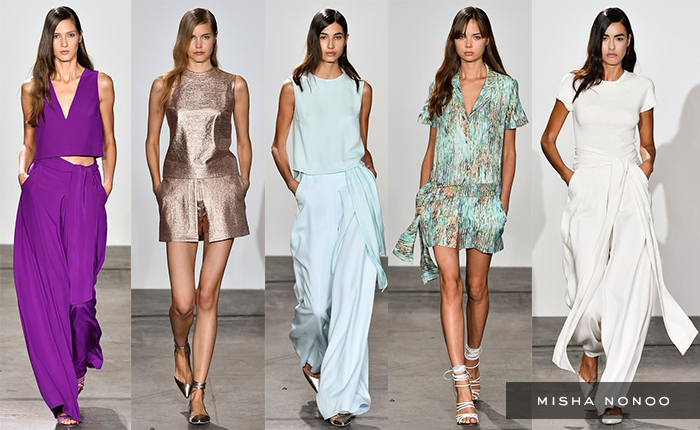 Sporty separates and fringed knits reigned supreme, but strappy knee-high sandals stole the show. A cool-girl’s collection to be sure. Ohne Titel is definitely a new fave! 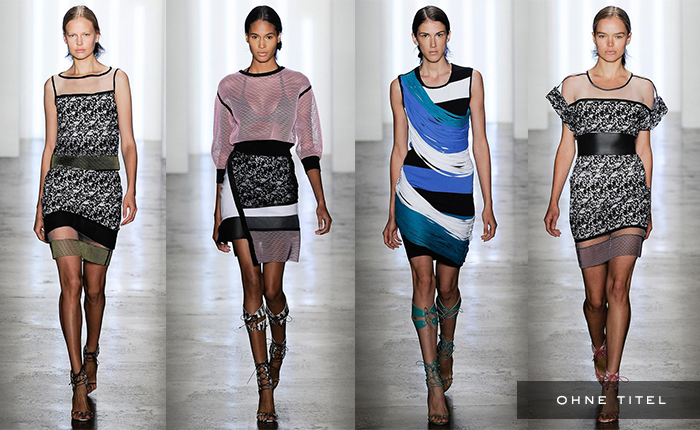 Tibi is always cutting edge, coming out with a fresh take on old favorites. 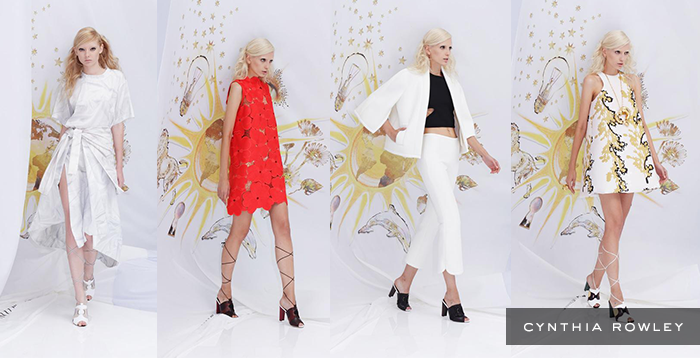 Think angelic dresses, new necklines, the coolest (embellished) culottes and equally fun mix-and-match separates. The shoes were also stellar. As always, I’ll be picking up a number of the solid pieces as spring wardrobe staples once the weather starts to warm up – that white dress is a dream! Shop more fabulous fall pieces by Tibi here. Leave it to Cynthia Rowley to steal my heart – mod shifts, mule sandals and major accessories (did you see my Instagram?) were totally speaking to me. These were my four favorite looks from the presentation, but there were a number of other sportier pieces that I know would be perfect for my current day-to-day schedule/lifestyle – i.e. lunch meetings straight to the gym! Don’t forget to check out her newly launched fall collection on her website. Great collections. I especially like Lela Rose, Nanette Lepore, and Tory Burch. NY was great, so many pretty colors and prints especially at Lela Rose. Dreamy! LOVED lela rose! great recap! Such amazing collections for spring! Tory Burch and Lela Rose are always favorites, but Nanette Lepore and Cynthia Rowley were so great too! I have to say that Lela Rose is my favorite, closely followed by Cynthia Rowley! I love the femininity of Lela Rose and the patterns are just beautiful! Lela Rose was one of my favorites…. If I could afford it, I’d wear it alllllllllll! I absolutely fell head over heels in love with Misha Nonoo and Lela Rose. Love, love, love.